Lately I’ve had occasional twinges of gadget-envy when reading about the new vegetable spiralizers, which allow you to make noodle shapes out of various vegetables, including carrots, sweet potato, and zucchini. Still, since I have zero cabinet space left (after my other unitaskers, like the waffle iron, the pizzelle iron, the cake pop maker, and the mini donut maker) I’ve been hesitant to buy one. So when I came across this carrot stripper for only $2.99 at TJ Maxx, I had to get it. 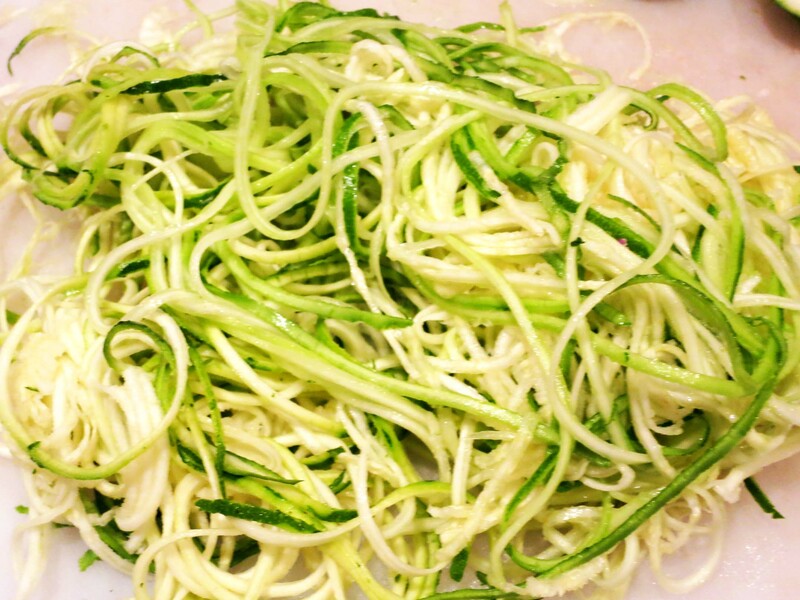 For my first try at spiralizing/stripping, I bought some smallish zucchini, less than 2″ in diameter. It was remarkably easy– much like using an oversized pencil sharpener. A few twists and I had a pile of zucchini noodles! But what to do with them? I read that you could just eat them raw, tossed with some olive oil and lemon juice for a summer salad, but for some reason that didn’t appeal. I decided to sauté them in butter and garlic– always a way to improve any vegetable– and top them with some panko bread crumbs toasted in more butter.